Learn more about your farmers! 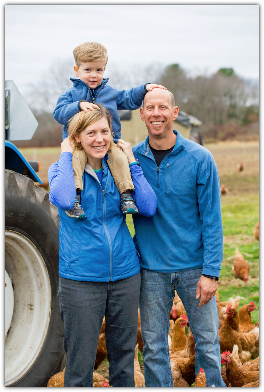 Pete and Jen are sustainable farmers, travelers, and lovers of good local food. Pete is the Farm Manager at Codman Community Farm and full time force behind Backyard Birds. He was formerly a veggie farmer for over twelve years on several farms. Jen is the Director for the New Entry Sustainable Farming project (http://www.nesfp.org), a Tufts University project which assists new immigrants and other beginning farmers to begin agricultural enterprises in Massachussetts. We met while studying organic agriculture at the UCSC Farm and Garden in Santa Cruz, CA and got married at Verrill Farm with our own <100-mile farm wedding (ie, we raised/sourced all our own local food and flowers for the ceremony!). Jen is originally from Indiana and holds degrees in Environmental Science and Public Policy from Indiana University and a Masters in Agricultural Policy from Tufts University. Pete grew up in the suburbs of Long Island, NY and holds a quite useless degree in Psychology from Ithaca College. We are both Returned Peace Corps Volunteers...Jen from Honduras where she taught hillside farming, and Pete from the Federated States of Micronesia (western Pacific Islands), where he taught nutrition and gardening. We love to travel, meet new and interesting people, and enjoy their wonderfully tasty local foods. 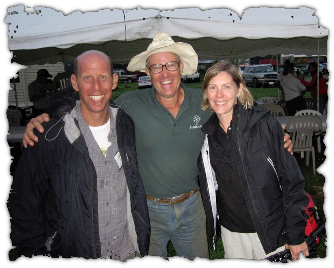 Here we are with our guru and idol, Joel Salatin, as his farm in Swoope, VA in 2010. We began our first flock of hens upon moving to Concord in 2003. With a rundown coop in our backyard and a desire to grow all our own food, we began our venture into livestock with two laying hens bought from Codman Farm in Lincoln. With these duo of hens, we bought another twelve that same year, then fifty or so the second year...and currently we have expanded to more over 1000 hens during the summer months. As we slowly grew our layer flock we also began adding other animals to the farm. First a few chickens for meat, then some pigs for tasty bacon, then a couple of rabbits for a nice rabbit stew, and well, you understand. Our business has continually expanded and have most recently joined forces with Codman Community Farm where we now call home. We are now living in Lincoln and managing Codman Farm along with all the other enterprises we have established over the years. We are immersed in farming in every facet of our lives and it is who we are. As our passion for farming has grown, so has our knowledge and expertise. We pride ourselves in being the best at what we do, constantly learning and improving, and we enjoy providing our community with nutritious, delicious, and as humanely-raised and processed products as possible - expanding the options to source your food from local farmers who are care deeply about the environment, animal welfare, and good quality products. If we don't feel good about it, we won't do it...and we are happy to share what we know and how we do things with others to spread the love and tasty food to all! Cheers to tasty, clean food for all!